Successfully Added Car Parking Sensor - Complete Kit Edition to your Shopping Cart. This complete car parking sensor kit is what every car needs, 4 sensors, a rear view camera, inteligent brain box, and an alarm that beeps to let you know of any obstacles ahead or behind. Whether you drive a luxury car like BMW, Mercedes, Porsche, Ferrari or a city car like the MINI, Ford, Smart, etc. This Reverse parking sensor kit comes complete with everything you need! 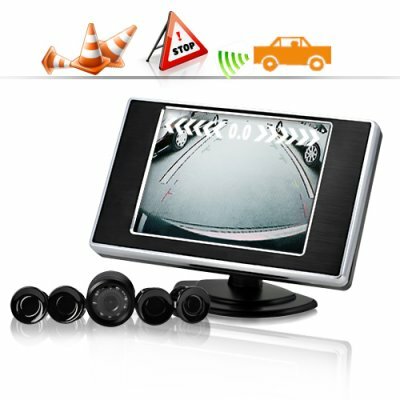 This vehicle revers parking sensor with monitor is constructed and designed to makes reverse maneuvering safe and easy. This complete DIY (do-it-yourself) kit comes with 4 sensors that utilize cutting-edge ultrasonic detection technology to notify drivers of the exact distance between the rear of their car and any obstacles. Using high-tech ultrasonic technology, this rear view parking sensor accurately measures distance in real time. Both the direction and exact distance of any obstacles are shown on the adjustable 3.5 inch TFT LCD scree display, which can conveniently be mounted anywhere in the car. This high quality rear view parking sensor is also built to handle rough weather conditions, so whether it's snowing, raining or hailing, this professional reverse car sensor along with the rear view camera will still function perfectly. Another great feature is that all 4 high-tech sensors are also specifically designed to blend in perfectly with your vehicle bumper and can be installed on all of today's big and small cars without the need for any extra parts. To find out more, simply click on "Add to Cart" and a sample will be shipped out to you straight away. This must have car accessory is brought to you by the leaders in wholesale consumer china electronics, Chinavasion. High quality, low prices!